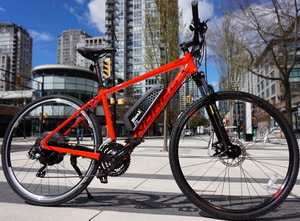 Beautiful and very Affordable Norco XFR 5 equipped with the latest BionX Power-assist System. Get in No Time, and with No Effort to Any Destination on Asphalt or Gravel with this Electric Cross-over Bike! Two great names combined - Norco and BionX: You could not ask for more.